Your company needs an ERP system. Where do you start? After paring down your Top ERP Vendor list, make sure to get vendor references with full contact information. If the Vendor is reluctant to provide references, demand them. If they still hesitate, suspend activity with that vendor until they provide references. Many vendors try to control the reference calls, but you should make the calls at your discretion, on your timetable and without the participation of the vendor. Talking to references early in the process is very beneficial. It gives you the opportunity to have a better understanding of the software, but more importantly, it gives you perspective on what you can expect after you make your decision. You’ll likely hear positives and negatives about the software and the vendor- just remember, there are always three sides to every story. Ask the reference to describe their business and the industries that they serve. Explain the top three to five goals you are looking to achieve. Ask the reference what goals they had prior to implementing goals? Were these goals achieved? If not, why? What are the greatest benefits the reference saw after the software was implemented? How was the vendor communication after the sale? How was the implementation support? Was the cost and time frame in line with what was discussed and quoted? If the reference had to do it again, would the company choose the same ERP software, same vendor, and same implementation team? After checking with references, schedule your final software demos. Take advantage of this time to ask any questions that have arisen during the process. Once again, make sure all members of the selection team view the demo, and be sure to evaluate how the solutions handles your business goals within 24 hours of each demo. Now, to the final steps. You should never choose the solution on price alone. If you allow price to enter your decision-making process, it usually becomes the center of attention and all the work you have done to carefully evaluate the solutions is goes by the wayside. You have all the information you need, and should make a decision based on which solution you feel would work best in your company. During this entire process, the focus has been on your business needs, and how the proposed solutions will address those needs. You have also observed how attentive the vendors are to your needs, and how well you feel they understand your business, along with how successfully you feel they will be in assisting you in your implementation. In addition, you gathered information from other customers when you conducted your reference interviews, and you discussed any troubling comments you heard with your vendors. You don’t need any other information, so it’s time to make a decision. When you have decided on the ERP software & vendor that you prefer, make sure to let them know that your ERP selection committee prefers their solution, and give them specifics on what they need to do to earn your business. At this point, you and the vendor should be able to come up with a mutually beneficial agreement. If it meets your satisfaction, sign the agreements and get the implementation process started. Did you miss Parts I through III of the series? 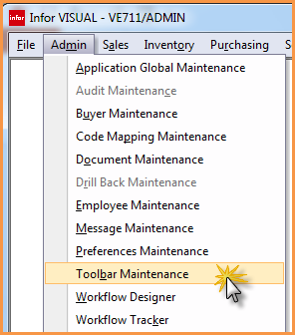 Did you know there is an application called "Toolbar Maintenance" that can be used to link to a report or add an application to your toolbar in VISUAL? This can make users more productive by giving them quick access to common programs, or direct links to reports related to the program they are using. 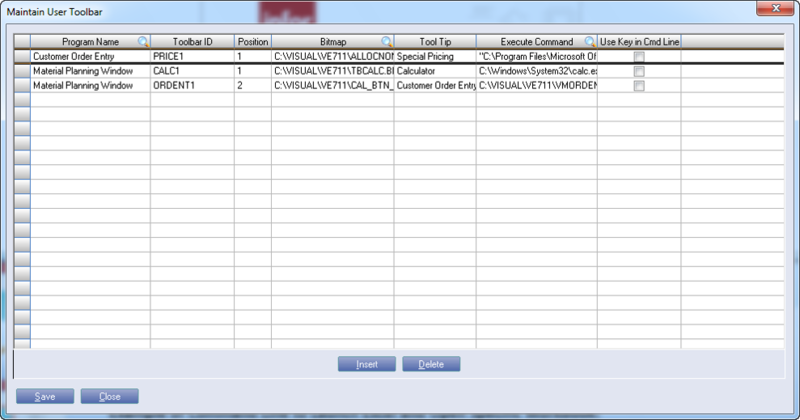 Toolbar Maintenance can also be used to launch VISUAL Macros from the toolbar. You can also create links to Custom Reports within your own new tab off of the Financial Standard Reports list. For VTA, a similar method is used. This is something that could be used for Payroll Verification Reports.